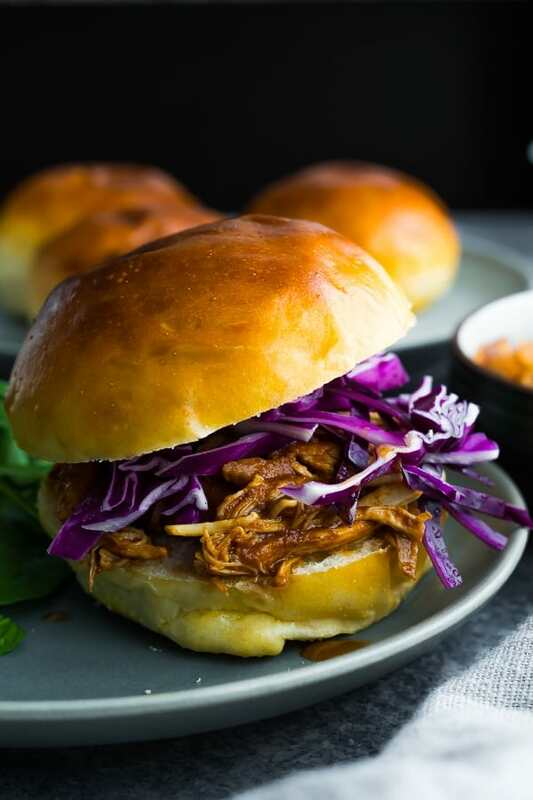 This easy crockpot bbq chicken makes the most delicious, juicy pulled chicken…perfect for sandwiches, tacos, wraps, and pizza! Just 5 simple ingredients and freezer crockpot compatible! Summer might not sound like prime time to rock your crock pot, but it’s actually the perfect time to have it out! Using your slow cooker means that you can keep your oven off, and we all want to keep our houses as cool as possible, right? 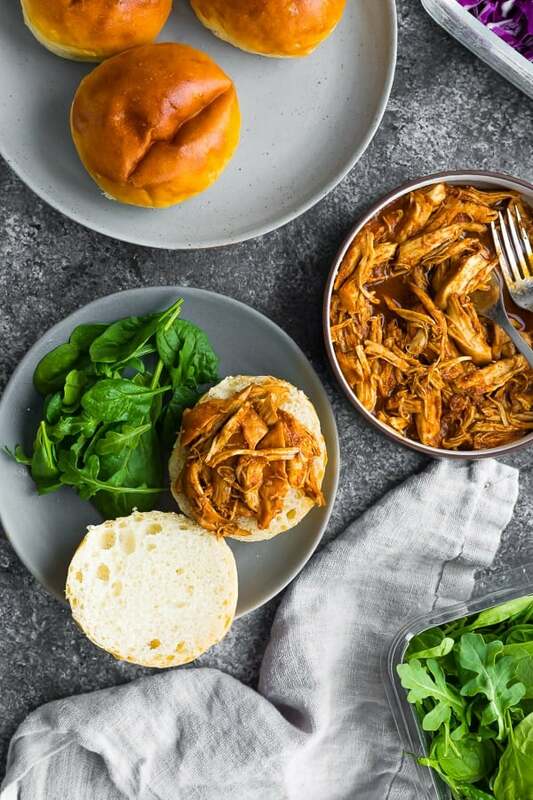 With that in mind, this crockpot bbq chicken is the perfect summery meal to make in your slow cooker! will keep your oven off! So incredibly simple! When you’re ready to cook, you will need to thaw completely before placing everything in the slow cooker and cooking on low for 4 hours. Can I swap the chicken breasts for chicken thighs? YES. 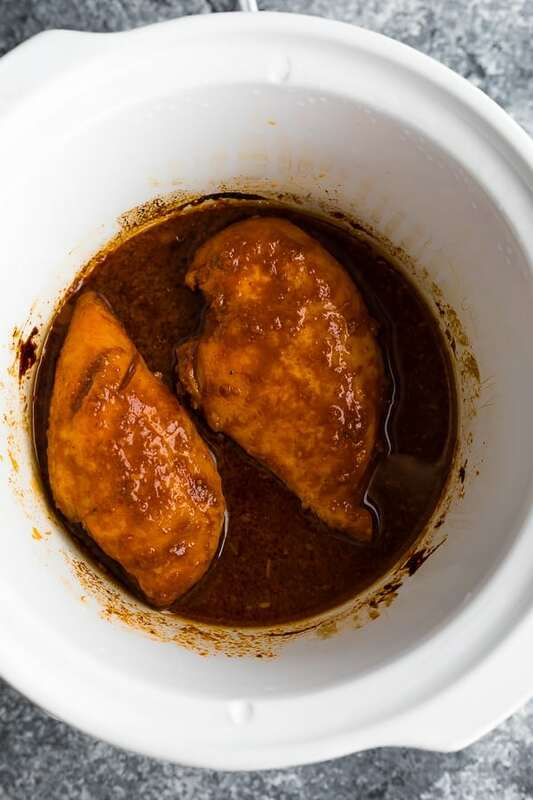 I love cooking boneless skinless chicken thighs in my slow cooker! Low 4-5 hours will be great for chicken thighs. 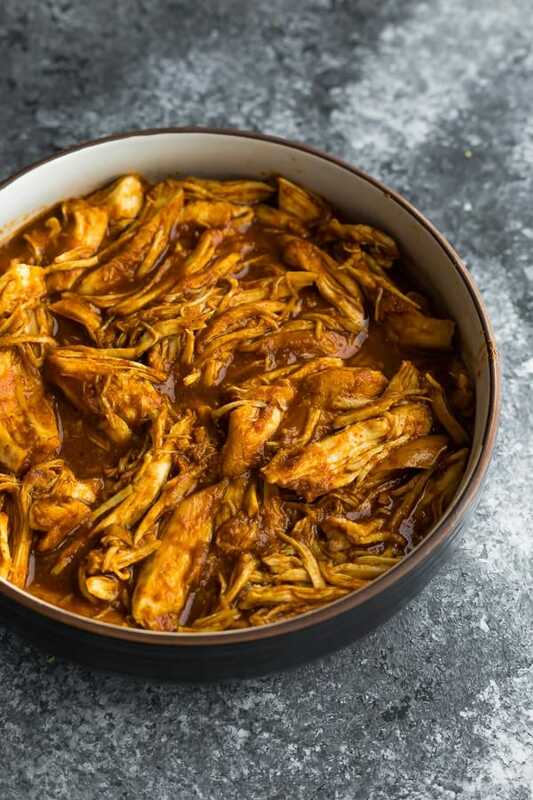 Can I cook this crock pot BBQ chicken in my Instant Pot? I haven’t tried this and believe it *should* work, however there might be an issue with the BBQ sauce being too thick to generate steam. If you get a ‘burn’ message, try adding a bit of chicken stock or water to thin it out. And if you give this a try, I’d love for you to let me know how it turned out for you! 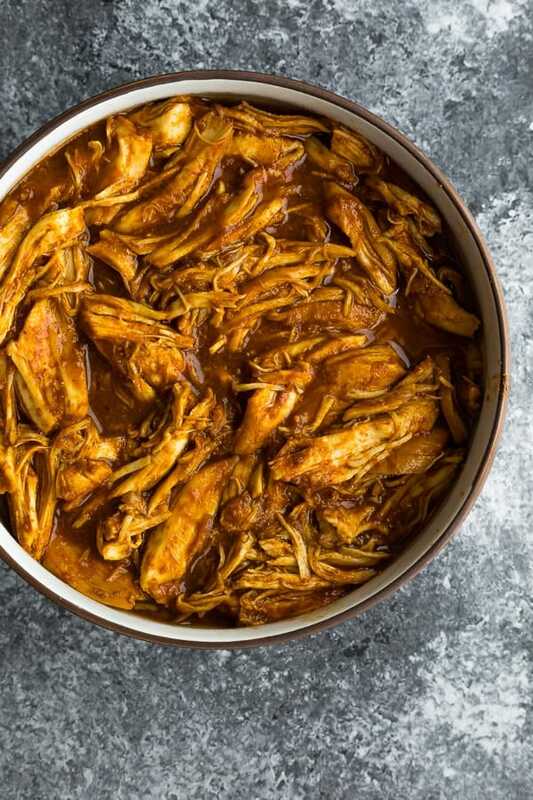 Can I half this crock pot BBQ chicken recipe? Yes, but you will need to cook in a smaller crock pot (2.5 quart). We simply cut the recipe in half and cook for the same amount of time, and it works great for our small family! 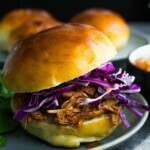 How can I serve this crockpot barbecue chicken? This recipe is pretty versatile and I have a ton of ideas for you! 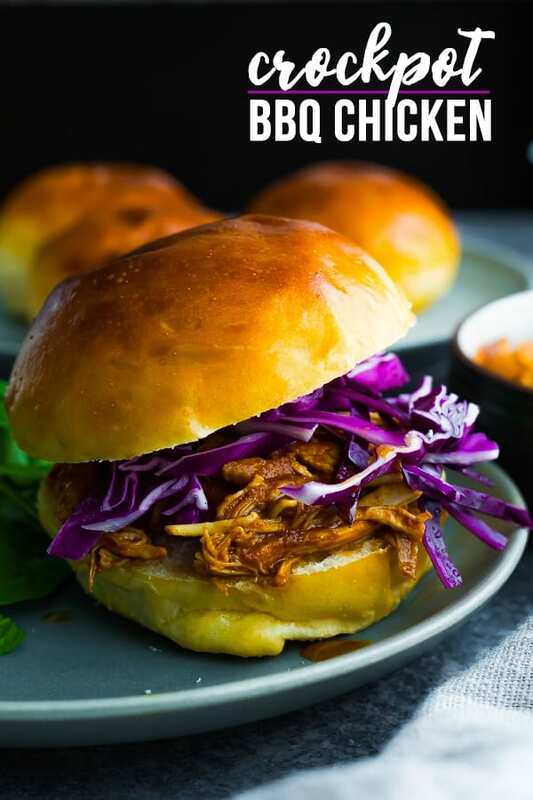 This easy crockpot bbq chicken makes the most delicious, juicy pulled chicken...perfect for sandwiches, tacos, wraps, and pizza! Just 5 simple ingredients and freezer crockpot compatible! Are the chicken slow cook receipes also ok to freeze post the entire crockpot cook? Yes exactly what I mean. Thank you. I made the honey soy and Mexican one tonight to freeze for meals next week 🙂 yum! Woo hoo! Hope you enjoy! 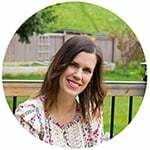 I have a 6.7 Quarts stockpot; can I use these recipes in this pot on the stove? Or is it better in the oven?